David Wright Miliband PC (born 15 July 1965) is chief executive of the International Rescue Committee and public policy analyst. A former British Labour Party politician, who was the Secretary of State for Foreign and Commonwealth Affairs from 2007 to 2010 and the Member of Parliament (MP) for South Shields from 2001 to 2013, he and his brother, Ed Miliband, were the first siblings to sit in the Cabinet simultaneously since Edward, Lord Stanley, and Oliver Stanleyin 1938. ￼￼He started his career at the Institute for Public Policy Research. Aged 29 he became Tony Blair's Head of Policy whilst the Labour Party was in opposition, and he was a contributor to Labour's manifesto for the 1997 election, which brought the party to power. Blair subsequently made him head of the Prime Minister's Policy Unit from 1997 to 2001, at which point Miliband was elected to Parliament for the seat of South Shields. Miliband spent the next few years in various junior ministerial posts, including at the Department for Education and Skills, before joining the Cabinet in 2006 as Environment Secretary. His tenure in this post saw climate change consolidated as a priority for policymakers. On the succession of Gordon Brown as Prime Minister in 2007, Miliband was promoted to become Foreign Secretary. At the age of 41, he became the youngest person to hold that office since David Owen 30 years earlier. In September 2010, Miliband narrowly lost the Labour leadership election to his brother Ed. On 29 September 2010, he announced that to avoid "constant comparison" with his brother Ed, and because of the "perpetual, distracting and destructive attempts to find division where there is none, and splits where they don't exist, all to the detriment of the party's cause", he would not stand for the Shadow Cabinet. On 15 April 2013, Miliband resigned from Parliament in order to take up the posts of President and CEO of the International Rescue Committee in New York City, which triggered a by-election. Born in London, Miliband is the eldest son of immigrant parents, Belgian-born Marxist sociologist Ralph Miliband and Polish-born Marion Kozak, both from Polish Jewish families. The latter was a teacher before she became a homemaker. He was given the middle name of "Wright" after the American sociologist C. Wright Mills, a friend of his father. He has said "I am the child of Jewish immigrants and that is a very important part of my identity." Both his Polish Jewish paternal grandparents lived in the Jewish quarter of Warsaw. His paternal grandfather, Samuel, a trained leather worker, served in the Red Army in the Polish–Soviet War of 1919–1921 before moving to Belgium. His paternal grandmother, Renia (later known as Renée), also moved to Belgium, where she first met Sam, and the couple married in 1923. The German invasion of Belgium in May 1940 split the Miliband family in half: Ralph and father Samuel fled to England, while Ralph's mother Renée and baby sister Nan stayed behind for the duration of the war. They were not reunited until 1950. His mother, a human rights campaigner and early CND member, survived the Holocaust thanks to being protected by Catholic Poles but her father, David's maternal grandfather did not. During his visit to Poland in June 2009, Miliband went to his family tomb in the Jewish Cemetery in Warsaw. He said of Poland, "My mother was born here, her life was saved by those who risked theirs sheltering her from Nazi oppression", and that he is "one of the million Britons who have Polish blood". Miliband was educated at Primrose Hill Primary School, in Camden, and Newlaithes Primary School, in Leeds. In September 1976, he passed the entrance examination to the newly independent, fee-paying Bradford Grammar School and from 1978-83, attended Haverstock Comprehensive School in North London. He obtained four A-levels (grades BBBD), and won admission to the University of Oxford. He studied at Corpus Christi College, Oxford, and obtained a first-class honours degree in Philosophy, Politics and Economics. From 1988-89, he sat a master's degree in Political Science at Massachusetts Institute of Technology, where he was a Kennedy Scholar. Miliband's first job was as a political analyst at the National Council for Voluntary Organisations (NCVO). From 1989 to 1994, he worked as a Research Fellow and policy analyst at the Institute for Public Policy Research (IPPR). He was appointed Secretary of the IPPR's Commission on Social Justice upon its foundation in 1992 by the then leader of the Labour Party, John Smith. In 1994 Miliband became Tony Blair's Head of Policy and was a contributor to Labour's manifesto for the 1997 general election. After Labour's victory in that election, Blair made him the de facto head of the Prime Minister's Policy Unit, a position which he held until the 2001 election. He was given the nickname "Brains" by Alastair Campbell, after the Thunderbirds character. In the 2001 general election he was elected to Parliament for the Labour stronghold of South Shields, succeeding David Clark. After a year as a backbench MP he was appointed Schools Minister, a junior minister in the Department for Education and Skills in June 2002. In 2003, Miliband voted to go to war in Iraq. Later, in 2010, he said that his decision was based on his belief that Iraq then had weapons of mass destruction. On 15 December 2004, in the reshuffle following the resignation of David Blunkett, he replaced Ruth Kelly as a Cabinet Office Minister. Following Labour's third consecutive election victory in May 2005, he was promoted to the Cabinet as Minister of State for Communities and Local Government within the Office of the Deputy Prime Minister. This was a newly created cabinet-level post with responsibility for housing, planning, regeneration and local government. Because the Deputy Prime Minister, John Prescott, was the Departmental Minister officially in charge of these portfolios, Miliband was not given the title Secretary of State but he was appointed a Privy Councillor and became a full member of the Cabinet. On 5 May 2006 following the local elections Tony Blair made a major cabinet reshuffle in which Miliband replaced Margaret Beckett as Secretary of State for Environment, Food and Rural Affairs. Miliband has said he believes agriculture is important for the UK's cultural heritage, economy and society and also for the environment. He has said disease control should be balanced with animal welfare. He attaches importance to reaching a "fair balance" among consumers, farmers, manufacturers and retailers. Miliband also believes the European Union and the World Trade Organization affect power relations between British and foreign farmers. He was the first British cabinet member to have a blog, though claims of excessive cost to the taxpayer provoked some controversy. In January 2007 Miliband sparked minor controversy by saying there was no evidence organic food was better than conventionally grown produce, though he later clarified that he was referring specifically to health benefits. Miliband is an advocate for international awareness of climate change and believes the cooperation of all nations is needed for environmental reform. Miliband's focuses include food retail waste management and greenhouse gas emissions in agricultural industries. He believes that the EU should go further in two areas: a low carbon global economy and global action on climate change. He also wants Europe to increase its economic competitiveness. By switching over to a low carbon economy, he plans to tackle climate change. He hopes to ensure a stable price on energy by securing an energy source and announced the Government's plans to legislate for carbon reductions at the United Nations General Assembly. In August 2006, in an effort to put environmental reform into action, Miliband developed a place for a collaborative "environmental contract" to be developed on a Defra Wiki site. It was subsequently linked to by blogger Paul Staines, and mocked, after which further edits by guest users were temporarily prevented. Miliband's emphasis on the necessity of an entirely cooperative effort to effectively instigate a low carbon lifestyle worldwide has led him to advocate an open dialogue among citizens about environmental issues through web-based blogging. Whilst Environment Secretary, Miliband called for all 27 nations of the European Union to unify in backing proposals to cut harmful emissions by 30% by 2020. Miliband has floated the idea of every citizen being issued with a "Carbon Credit Card" to improve personal carbon thrift. Miliband argues individuals have to be empowered to tackle global warming — "the mass mobilising movement of our age". On 28 June 2007, the day after Gordon Brown became Prime Minister, Miliband was appointed Foreign Secretary. He was Britain's third youngest Foreign Secretary and the youngest person to be appointed to the post since David Owen (in office 21 February 1977 – 4 May 1979). Anthony Eden had assumed office at the age of 37 in 1935. David's younger brother, the economist Ed Miliband, was the Secretary of State for Energy and Climate Change, making them the first siblings to serve together in Cabinet since Edward, Lord Stanley, and his brother Oliver in 1938. Miliband's first Foreign Office questions session as Foreign Secretary in the House of Commons was on 3 July 2007. On the morning of 13 December 2007, Miliband stood in for Prime Minister, Gordon Brown at the official signing ceremony in Lisbon of the EU Reform Treaty, which was attended by all other European heads of government. Brown was otherwise engaged at the House of Commons, appearing before the Liaison Committee, and travelled to Portugal to sign the treaty in the afternoon. He was left on his own again by the Prime Minister to speak in favour of the European Union (Amendment) Bill in the House on 21 January 2008. On 21 February 2008, Miliband admitted (despite previous government denials) that two U.S. extraordinary rendition flights had stopped on Diego Garcia, a U.K. territory, in 2002. When questioned as to whether the government had deliberately misled the public over rendition, Miliband apologised and stated that the government had "made a mistake". On 5 February 2009, Miliband made a statement to the House of Commons concerning Guantanamo Bay detainee and former British resident Benyam Mohammed. A week later Mohamed's American lawyer Yvonne Bradley flew to Britain to urge the Foreign Office to press harder for his release. On 23 February 2009, Benyam Mohammed returned to Britain and was granted temporary residence. However, in July 2010, Clive Stafford Smith accused former Foreign Secretary David Miliband of "fighting tooth and nail" to prevent the release of vital documents during the Binyam Mohamed case. After his trip to India in 2008 following the Mumbai attacks, Miliband wrote in an article that "resolution of the dispute over Kashmir would help deny extremists in the region one of their main calls to arms, and allow Pakistani authorities to focus more effectively on tackling the threat on their western borders". This sparked an angry response from the Indian government, whose long standing policy had been not to accept any third party involvement in the dispute of Kashmir. An Indian analyst suggested that his tone implied that India must shoulder some of the responsibility because of its policies in Kashmir. Some reports also said that Miliband's tone towards the Indian Prime Minister and the Finance Minister had been aggressive, and that he had been excused for being a "young man". During the latter stages of the Sri Lankan Army's 2008/09 offensive against the LTTE, Miliband travelled to Sri Lanka to press the government to call a ceasefire with the Tamil Tigers, citing concerns for civilians caught in the crossfire. Miliband's visit was met with protests by Sri Lankan nationalists, who accused Miliband of attempting to save the lives of Tamil Tiger militants. During the victory celebrations that took place a few weeks later, a burning effigy of Miliband was reported to have been tossed over the gate of the British High Commission in Colombo. that much of [Her Majesty's government] and ministerial attention to Sri Lanka is due to the "very vocal" Tamil diaspora in the UK, numbering over 300,000, who had been protesting in front of Parliament since 6 April. with UK elections on the horizon and many Tamils living in Labour constituencies with slim majorities, the government is paying particular attention to Sri Lanka, with Miliband recently remarking to Waite that he was spending 60 per cent of his time at the moment on Sri Lanka. In August 2009, Miliband was a guest on BBC Radio 4's Great Lives programme, choosing South African Communist Party leader and anti-apartheid activist Joe Slovo. Miliband stated during the programme, in a response to a question about terrorism, that "yes, there are circumstances in which it is justifiable and yes, there are circumstances in which it is effective, but it is never effective on its own". These comments were criticised by Menzies Campbell and William Hague. The Treaty of Lisbon creates the post of High Representative of the Union for Foreign Affairs and Security Policy for the European Union, a post commonly known as the European Foreign Minister. In autumn 2009, as the treaty came close to coming into force, Miliband was named as being under consideration for the post as EU officials regarded him as "ideal material". Miliband publicly insisted that he was not available to fill the post, as he was committed to remaining in the British cabinet. Baroness Ashton, a fellow British Labour politician and then European Commissioner for Trade, was ultimately appointed to the post instead. On 23 March 2010, the UK expelled an Israeli diplomat owing to claims that an embassy official from that country forged passports, relating to the assassination of Mahmoud Al-Mabhouh, and Miliband gave a public warning against travel to Israel because of identity theft concerns. On 29 July 2008, Miliband wrote an article in The Guardian that outlined his vision of a future of the Labour Party but made no mention of Gordon Brown. The piece was widely interpreted as a leadership challenge to the then Prime Minister, not least because the timing of its publication – just after Brown's departure on holiday at the start of the parliamentary summer recess, and while there was intense speculation about his continuing leadership following Labour's defeat in the Glasgow East by-election the previous week – seemed designed to produce a large political impact. In the following days two Labour MPs called on Brown to sack Miliband for his perceived disloyalty. Miliband, while denying claims by his detractors that he was seeking to provoke an early leadership election, did not rule himself out of eventually running for the leadership of the party. Many grassroots supporters believed a David Miliband-led Labour Party would tackle the Conservatives more effectively, reaching out to voters in marginal seats as well as securing Labour's core support. The Labour Party lost the UK general election held on 6 May 2010, and Gordon Brown soon announced that he was standing down as leader of the party. On 12 May, flanked by 15 supportive members of the parliamentary party, Miliband announced from outside the House of Commons that he would stand in the resulting leadership election. On 10 June 2010, Barry Sheerman, Huddersfield MP, nominated Miliband for the Labour Party leadership post with Mr. Sheerman's daughter, Madlin Sadler, as Miliband's Campaign Co-ordinator. Madlin Sadler had served under Miliband previously as Special Advisor. The other contenders for the leadership were Ed Balls, Andy Burnham, Diane Abbott and David's brother Ed Miliband, with David Miliband gaining the most nominations. The result of the contest was announced on 25 September 2010, the day before the start of the 2010 Labour Party Conference in Manchester. While David Miliband led the share of the electoral college votes in the first three rounds, he lost in the final round (50.65% to 49.35%) to his brother Ed. He announced on 29 September 2010 that he would be quitting frontline politics and would not be a part of his brother Ed's shadow cabinet. Miliband resigned from the shadow cabinet in October 2010, but continued to serve as the MP for South Shields. He also taught A-Level Government and Politics on a voluntary basis at Haverstock School. In 2011, he became Senior Global Advisor for Oxford Analytica. On 26 March 2013 the Daily Mirror reported that Miliband would be announcing the following day that he intended to resign as an MP and leave politics altogether. He announced that he was taking up the post of head of the International Rescue Committee in New York, for which his remuneration would be £300,000 ($450,000) a year. Miliband became the president and CEO of the International Rescue Committee on 1 September 2013. At the IRC, Miliband has been overseeing humanitarian aid and development programs in 40 countries, a global staff of 12,000 and 1,300 volunteers, and an annual budget of $450 million. Near the top of the IRC, Miliband again installed his former Special Political Advisor from London, Madlin Sadler. She became the aid agency's Chief of Staff. The IRC has been responding to Syria's refugee crisis. On the ABC News programme of 13 October 2013, This Week with George Stephanopoulos, Miliband commented that he worried about the immediate effects of the current diplomatic solution in Syria of sending in Chemical Weapons Inspectors and destroying the chemical stockpiles would have on the ongoing crisis. He said: "We’re concerned that people think that somehow, because the chemical weapons seem to be addressed, that the Syrian conflict, the regional conflict, is done and dusted.” On 10 October 2013, he said there were huge risks in not intervening militarily. "We've got people on the ground, not just in Syria but in Turkey, Lebanon, Jordan and Iraq,” he told a foreign policy discussion in Manhattan. “I’ve got people who are in danger.” He quoted Frederick the Great, saying: “Diplomacy without weapons is like music without instruments”. His policy opinions were at odds with his younger brother, Ed Miliband, the Labour Party's Leader in the UK who insisted that the Labour Party would not back military intervention. On 28 February 2014, in a TV interview with KPBS Evening Edition in San Diego, Miliband reiterated that the US and other nations needed to intervene "both politically as well as financially" in Syria where one in two Syrians was displaced because the government of Bashar al-Assad was "dropping barrel bombs on its own citizens". On KPBS TV, he revealed that the IRC was running cross-border aid to Syrians beyond the scope of the United Nations. Miliband said such "cross border aid" has reached about a half million Syrians with medical aid in cities that were "besieged and cut off from the UN help". Another half million Syrians, said Miliband, had received non-medical aid. Miliband stated that in the UN's absence, "It comes to International NGOs, non governmental organisations, to get across the border crossings and weave their way between the conflict lines to reach people." He stated the need for such extraordinary efforts was great and the need for such ingenuity was even greater. On 10 November 2013, as IRC CEO, Miliband ordered the war relief agency to mount an emergency response to a natural disaster—Typhoon Haiyan in the Philippines. He announced a huge donation drive for funds dedicated exclusively to the storm: "In the face of a rising death toll and widespread humanitarian catastrophe the International Rescue Committee (IRC) has dispatched an emergency team to Manila and launched a $10 million appeal in order to implement the most appropriate response. We have today taken the decision to deploy emergency relief coordinators to the Philippines, with a view to deciding with the host government which of IRC's areas of expertise — from water and sanitation to education — are most needed. The IRC’s emergency unit will start work immediately." Miliband is co-chair of the Global Ocean Commission which was founded in February 2013. In 2017, the organization provided 1.14 million children with schooling and education; helped resettle 10,665 refugees and special immigrant visa holders in the US; and filed 663 affidavit of relationships to help reunite families separated at the US border. In April 2018, Miliband told the New York Times that he joined the IRC with the idea that it "should not be a sleeping giant, it should be a roused leader in the global humanitarian sector." In May 2018 Miliband joined Nick Clegg and Nicky Morgan in calling for a soft Brexit. The Daily Telegraph's investigation of expenses claims by Members of Parliament reported that Miliband had claimed for gardening expenses and approximately £30,000 in repairs, decorations and furnishings for his constituency home in South Shields. A spokesperson said: "At every stage, David Miliband followed the procedures and rules as laid out by the parliamentary authorities". On 21 December 2010, the Office of David Miliband Limited was formed with Miliband and his wife Louise as directors. According to the Financial Times, "much of Mr Miliband’s time has been spent on his lucrative directorships and speaking roles, which he would be expected to give up if he returned to frontline politics…as of January 2013, David Miliband has made just short of £1m on top of his MP’s salary since he failed to win the Labour leadership in the summer of 2010." According to a March 2013 article in the Huffington Post UK, Miliband has earned almost £1m since the 2010 election. The article listed sources of income from speaking (where he has earned up to £20,000 per event), advisory and teaching roles, journalism, gifts, hospitality and overseas visits. David Miliband is one of six members of the Global Advisory Board of Macro Advisory Partners, which advises multinational corporations, sovereign wealth funds, investors and governments. In January 2012, David Miliband joined the Board of Directors of Mauritius-based private equity group, Indus Basin Holdings. IBH operates Rice Partners  in the Punjab region of Pakistan which specialises in managing the end-to-end supply chain for major global users of rice. According to the Financial Times, "Mr Miliband’s jobs include advisory roles with VantagePoint Capital Partners, a Californian group; Oxford Analytica, a UK advisory company; and Indus Basin Holdings, a Pakistani agrochemical group. He is also a member of the advisory board to the Sir Bani Yas academic forum, which is hosted by the Ministry of Foreign Affairs of the United Arab Emirates. Despite supporting Arsenal, Mr Miliband is vice-chairman and a non-executive director of Sunderland. As a speaker he commands a fee of up to £20,000." Miliband is also on the Advisory Board of VantagePoint Capital Partners. David Miliband is a member of the Trilateral Commission, founded and chaired by David Rockefeller. Miliband married Louise Shackelton, a professional violinist formerly with the London Symphony Orchestra, in 1998. Shackelton and Miliband have adopted two newborn sons from the United States, the first in December 2004 and the second in October 2007, and currently live in New York City's Upper West Side. In an interview with CNN in 2009, Miliband stated that he grew up in a secular setting and describes himself as an atheist with a "huge respect" for people of faith. Miliband was portrayed by Henry Lloyd-Hughes in the docu-drama Miliband of Brothers, with Ed Miliband being portrayed by Lloyd Hughes' brother Ben Lloyd-Hughes. 2016 Honorary Doctorate, The New School. Gutch, Richard; Miliband, David; Percival, Richard (1989). Publish and still not be damned: a guide for voluntary groups on the provisions of the 1986 and 1988 Local Government Acts regarding political publicity and the promotion of homosexuality. National Council for Voluntary Organisations. ISBN 978-0-7199-1251-1. Tindale, Stephen; Miliband, David (1991). Beyond economics : European government after Maastricht. Discussion paper, no. 12. Fabian Society. ISBN 978-0-7163-3012-7. Miliband, David (1992). A more perfect union? Britain and the new Europe. IPPR. ISBN 978-1-872452-53-1. Miliband, David (1994). Reinventing the Left. Polity Press. ISBN 978-0-7456-1390-1. Miliband, David (2006). Empowerment and the deal for devolution. ODPM. ISBN 978-1-85112-842-6. Miliband, David (2017). Rescue: Refugees and the Political Crisis of Our Time. TED Books. ISBN 978-1-50115-439-3. ^ a b c d Gelles, David (21 April 2019). "Corner Office: The Devil Can't Have the Best Tunes". The New York Times. ^ a b "David Miliband — Somerville College Oxford". University of Oxford. Retrieved 24 May 2016. ^ "David Miliband – President & CEO of the International Rescue Committee (IRC)". rescue.org. Retrieved 24 May 2016. ^ Mulholland, Hélène (29 September 2010). "David Miliband quits frontline politics". The Guardian. London. Archived from the original on 30 June 2009. Retrieved 29 September 2010. ^ a b "David Miliband to step down as MP". BBC News. 26 March 2013. Archived from the original on 27 March 2013. Retrieved 26 March 2013. ^ "May 2 the likely date for South Shields by-election". Shields Gazette. 28 March 2013. Archived from the original on 30 June 2009. Retrieved 29 September 2013. ^ a b "Being Jewish must have an influence on the way I think. I am the child of Jewish immigrants and that is a very important part of my identity." – from Josephs, Bernard (22 December 2006). "David Miliband: Red to green in a generation". The Jewish Chronicle. Archived from the original on 30 June 2009. Retrieved 30 November 2009. ^ Mendick, Robert (16 May 2010). "The miraculous escape of Marion Miliband". The Daily Telegraph. London. Archived from the original on 23 May 2010. Retrieved 7 June 2010. ^ Birnbaum, Norman (30 March 2009). "The half forgotten prophet: C. Wright Mills". The Nation. Archived from the original on 23 March 2014. Retrieved 30 January 2014. ^ Luke Harding (30 May 2008). "Luke Harding: Moscow diary". The Guardian. London. Archived from the original on 31 May 2008. Retrieved 16 March 2010. ^ Porter, Andrew (9 September 2008). "David Miliband four-letter abuse from Russian foreign minister". The Daily Telegraph. London: Telegraph Blogs. Archived from the original on 16 February 2010. Retrieved 16 March 2010. ^ Andy Beckett (28 February 2004). "In the house of the rising sons". The Guardian. Archived from the original on 2 February 2009. ^ "Biographies: Lipman, Miliband & Saville". The Lipman-Miliband Trust. 15 August 2007. Archived from the original on 31 October 2007. Retrieved 22 October 2007. ^ Kamil Tchorek (24 June 2009). "David Miliband visits family grave in Poland". The Times. London. Retrieved 28 June 2009. ^ "European renewal amidst global adversity (23/06/2009)". Foreign & Commonwealth Office. 23 June 2009. Archived from the original on 27 September 2012. Retrieved 28 June 2009. ^ McIntyre, Annette (24 June 2010). "...and that he would never be a professional footballer". Telegraph & Argus. Archived from the original on 30 June 2009. Retrieved 10 January 2012. ^ "Meet the new boy". The Guardian. 4 June 2002. Archived from the original on 30 June 2009. ^ Pierce, Andrew (30 July 2008). "Profile of Foreign Secretary David Miliband". The Daily Telegraph. London. Archived from the original on 30 June 2009. Retrieved 7 June 2010. ^ "A Levels discussed". BBC News. 17 August 2003. Archived from the original on 30 June 2009. Retrieved 2 May 2007. ^ "David Miliband Biography". Archived from the original on 30 June 2009. Retrieved 22 September 2008. ^ "Commission on Social Justice". IPPR. Archived from the original on 30 June 2009. Retrieved 3 August 2008. ^ "Heir to Blair?". The Observer. London. 20 October 2002. Archived from the original on 30 June 2009. Retrieved 3 May 2007. ^ Sparrow, Andrew (8 March 2010). "Miliband challenged over ministers' explanations for Iraq war decision". The Guardian. Archived from the original on 4 November 2013. ^ "Privy Council Members". Archived from the original on 24 December 2008. Retrieved 12 September 2008. ^ Assinder, Nick (5 May 2006). "Reshuffle seeks to rejuvenate". BBC News. Archived from the original on 30 June 2009. Retrieved 2 May 2007. ^ "Speech by the Rt Hon. David Miliband MP – "One planet farming" at the Royal Agricultural Show, Monday 3 July 2006". DEFRA. 4 July 2006. Archived from the original on 6 June 2007. Retrieved 2 May 2007. ^ Deedes, Henry (16 June 2006). "£40,000 – the real cost of reading David's diary". The Independent. London. Archived from the original on 21 April 2009. Retrieved 27 July 2006. ^ "Written Parliamentary Question on cost of blog". Hansard. 16 June 2006. Archived from the original on 25 August 2006. Retrieved 11 September 2006. ^ "Miliband questions organic quality". ePolitix.com. 7 January 2007. Archived from the original on 19 June 2007. Retrieved 2 May 2007. See also: "Making the Most of Organic Food". DEFRA. 8 January 2007. Archived from the original on 9 June 2007. Retrieved 2 May 2007. ^ Miliband, David (6 June 2007). "Greening the American Dream". DEFRA. Archived from the original on 9 June 2007. See also: United Nations General Assembly Session 62 Verbatim Report 9. A/62/PV.9 page 45. Mr. Miliband United Kingdom 27 September 2007. Retrieved 12 November 2007. ^ "Wiki Wickedness". Global & General Nominees LLC. 1 November 2006. Retrieved 1 September 2006. ^ "'Now or never' for climate action". BBC News. 18 February 2007. Archived from the original on 20 May 2012. Retrieved 2 January 2010. ^ "Carbon 'credit card' considered". BBC News. 11 December 2006. Archived from the original on 19 January 2007. Retrieved 2 May 2007. ^ Traynor, Ian (14 December 2007). "Miliband plays stand-in at lavish EU relaunch". The Guardian. London. Archived from the original on 15 December 2007. Retrieved 1 April 2010. ^ Hansard: Volume No. 470 Part No. 34 House of Commons Debates January 21, 2008 and see Division #50. ^ "UK apology on US terror flights". BBC News. 21 February 2008. Archived from the original on 25 August 2006. Retrieved 21 February 2008. ^ "Miliband statement on Benyam Mohammed". TheyWorkForYou. 5 February 2009. Archived from the original on 17 February 2009. ^ "Freed detainee 'happy to be home'". BBC News. 23 February 2009. Archived from the original on 23 February 2009. Retrieved 26 December 2009. ^ "Military lawyer who freed Mohamed". BBC News. 24 February 2009. Archived from the original on 27 February 2009. Retrieved 26 December 2009. ^ "David Miliband: 'War on terror' was wrong". The Guardian. London. 15 January 2009. Archived from the original on 17 January 2009. Retrieved 15 April 2010. ^ Kapil Komireddi (23 January 2009). "Keep out of Kashmir". The Guardian. London. Archived from the original on 25 January 2009. Retrieved 16 March 2010. ^ Merrick, Jane (18 January 2009). "Miliband's trip to India 'a disaster', after Kashmir gaffe". The Independent. London. Archived from the original on 23 April 2010. Retrieved 16 March 2010. ^ "David Miliband comments on Kashmir welcomed by 'terrorist' group". The Daily Telegraph. 18 January 2009. Archived from the original on 25 August 2006. ^ Page, Jeremy (26 April 2009). "David Miliband heads to Sri Lanka to urge ceasefire". The Times. London. Archived from the original on 9 May 2009. Retrieved 1 April 2010. ^ "Monks protest Miliband visit". Archived from the original on 30 November 2010. ^ "Effigy of David Miliband burnt on streets of Sri Lankan capital". The Times. London. Archived from the original on 19 May 2009. ^ "WikiLeaks: David Miliband 'championed aid to Sri Lanka to win votes of Tamils in UK'". The Daily Telegraph. 2 December 2010. Archived from the original on 5 December 2010. ^ "Wikileaks cables: David Miliband focused on Sri Lankan war 'to win votes'". The Guardian. Archived from the original on 3 December 2010. ^ "Radio 4 Programmes – Great Lives, Series 19, Joe Slovo". BBC Radio 4. BBC News. Archived from the original on 15 August 2009. Retrieved 16 March 2010. ^ Hélène Mulholland and agencies (17 August 2009). "Miliband attacked over terrorism comments". The Guardian. London. Archived from the original on 17 August 2009. Retrieved 16 March 2010. ^ Patrick Hennessy; Bruno Waterfield (11 October 2009). "... or it could be Miliband, the EU international overlord". The Sunday Telegraph. HighBeam Research. p. 8. Archived from the original on 20 November 2009. ^ "Baroness Ashton appointed as EU's foreign policy chief". BBC News. 19 November 2009. Archived from the original on 20 November 2009. Retrieved 25 November 2009. ^ Stringer, David (23 March 2010). "UK expels Israeli diplomat over Dubai case". Yahoo! News. Associated Press. Archived from the original on 5 April 2014. Retrieved 26 March 2010. ^ Miliband, David (29 July 2008). "Against all odds we can still win, on a platform for change". The Guardian. London. Archived from the original on 31 July 2008. Retrieved 2 August 2008. ^ "Miliband calms leadership talk". Reuters. 31 July 2008. Archived from the original on 12 January 2009. Retrieved 2 August 2008. ^ "Miliband denies 'leadership' bid". BBC News. 30 July 2008. Archived from the original on 31 July 2008. Retrieved 2 August 2008. ^ Allegra Stratton (12 May 2010). "David Miliband announces Labour leadership bid". The Guardian. London. Archived from the original on 13 May 2010. Retrieved 7 June 2010. ^ "Barry Sheerman nominates David Miliband for Labour leader". Huddersfield Daily Examiner. 10 June 2010. Retrieved 24 November 2013. ^ Hélène Mulholland (29 September 2010). "David Miliband quits frontline politics". The Guardian. Archived from the original on 30 June 2009. ^ Singh, Anita (11 January 2011). "David Miliband to become a teacher". The Daily Telegraph. London. Archived from the original on 30 June 2009. ^ "Oxford Analytica – DavidMiliband". Oxan.com. Archived from the original on 16 May 2011. Retrieved 26 March 2013. ^ Robert Booth (27 March 2013). "David Miliband faces a diplomatic test at the IRC". The Guardian. Archived from the original on 28 March 2013. Retrieved 28 March 2013. ^ "David Miliband 'feared being distraction' for Labour". BBC News. 27 March 2013. Archived from the original on 27 March 2013. Retrieved 28 March 2013. 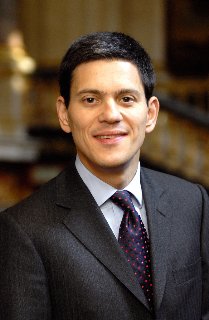 ^ "David Miliband, Former UK Foreign Secretary, Takes Helm of International Rescue Committee". U.S. Newswire. New York City. PR Newswire. 3 September 2013. Archived from the original on 2 November 2013. Retrieved 24 November 2013. ^ "IRC Leadership". International Rescue Committee (IRC). Archived from the original on 2 November 2013. Retrieved 24 November 2013. ^ "Rescue and Refugee Support". Rescue.org. Retrieved 24 November 2013. ^ Crowder, Anja (13 October 2013). "David Miliband Calls Nobel Peace Prize Award 'A Bit of an Irony'". ABC News. Archived from the original on 13 October 2013. Retrieved 24 November 2013. ^ Jon Swaine (10 October 2013). "David Miliband warns of 'huge risks' of Western retreat from international engagement". The Daily Telegraph. Archived from the original on 11 October 2013. Retrieved 24 November 2013. ^ Holehouse, Matthew (6 September 2013). "Syria crisis: Tony Blair criticises Ed Miliband's stance on military action". The Daily Telegraph. Archived from the original on 9 September 2013. Retrieved 24 November 2013. ^ a b Megan Burke; Peggy Pico (28 February 2014). "International Rescue Committee's David Miliband On What U.S. Can Do To Help Syrian Refugees". KPBS. Archived from the original on 3 April 2014. Retrieved 3 March 2014. ^ "International Rescue Committee deploys to Philippines in response to Typhoon Haiyan" (Press release). International Rescue Committee UK (IRC-UK). 11 November 2013. Archived from the original on 2 December 2013. Retrieved 24 November 2013. ^ Culbertson, Alix (14 May 2018). "David Miliband joins Nick Clegg and Nicky Morgan in call for soft Brexit". Sky News. Retrieved 14 May 2018. ^ Prince, Rosa (8 May 2009). "Daily Telegraph: David Miliband". The Daily Telegraph. London. Archived from the original on 11 May 2009. Retrieved 13 May 2009. ^ a b Pickard, Jim (18 January 2013). "Spotlight cast on David Miliband earnings". Financial Times. Archived from the original on 22 January 2013. Retrieved 24 November 2013. ^ "David Miliband 'Could Earn Hundreds Of Thousands Of Dollars' At International Rescue Committee". The Huffington Post. 27 March 2013. Retrieved 24 November 2013. ^ "Global Advisory Board". Macro Advisory Partners. Archived from the original on 2 November 2013. Retrieved 24 November 2013. ^ "Indus Basin Holdings – Businesses". Indus Basin Holdings. Archived from the original on 2 December 2013. Retrieved 24 November 2013. ^ Tirmizi, Farooq (25 October 2011). "Cutting out the middleman: Global food giant to buy Pakistani rice directly from the paddy". The Express Tribune (Pakistan). Archived from the original on 25 October 2011. Retrieved 24 November 2013. ^ Tirmizi, Farooq (21 January 2012). "High connections: David Miliband joins Pakistani private equity firm". The Express Tribune. Archived from the original on 3 December 2013. Retrieved 24 November 2013. ^ "Advisory Council |". VantagePoint Capital Partners. Archived from the original on 13 May 2012. Retrieved 24 November 2013. ^ "THE TRILATERAL COMMISSION JANUARY 2013" (PDF). The Trilateral Commission. Archived from the original (PDF) on 20 December 2013. Retrieved 23 March 2015. "David Miliband, Member of the British Parliament; former Secretary of State for Foreign and Commonwealth Affairs, London"
^ Wheeler, Brian (29 September 2010). "The David Miliband Story". BBC News. Archived from the original on 22 May 2013. Retrieved 29 September 2013. ^ Vivienne Russell (3 February 2006). "Miliband makes his mark". PublicFinance. ^ "David's Story". Archived from the original on 5 March 2011. ^ "David Miliband adopts second son". BBC News. 29 October 2007. Archived from the original on 30 June 2009. Retrieved 29 October 2007. ^ Clout, Laura (13 June 2008). "David Miliband speaks of adopting his sons". The Daily Telegraph. London. Archived from the original on 30 June 2009. Retrieved 11 May 2010. ^ Sarah Lyalll (6 December 2013). "An Englishman in New York". The New York Times. Archived from the original on 31 August 2014. Retrieved 21 April 2014. ^ "Interview With David Miliband". CNN. 5 July 2009. Archived from the original on 30 June 2009. Retrieved 24 January 2010. ^ "LAVERNE COX, DIANE VON FURSTENBERG, DERAY MCKESSON NAMED HONORARY DEGREE RECIPIENTS BY THE NEW SCHOOL". 31 March 2016. Wikimedia Commons has media related to David Miliband.